After the citizens of Tuzla took to the streets, and thereafter the citizens of still other cities, and after the stoning and burning of the cantonal governments in Tuzla, Sarajevo, Zenica, Mostar, Bihac as well as the burning of numerous other buildings, including the Presidency of BiH, the municipal buildings in Mostar, in addition to the offices of the SDA and HDZ in this city, a number of officials in BiH attempted to manipulate these events and shift the focus away from socio-economic questions and instead towards nationalist ones. Precisely because of such statements, we can conclude that the local politicians, whatever party they may come from, have learnt nothing from the events of the past few days. We have heard nationalist rhetoric from officials in both entities, who come from predominantly ethnically orientated parties, but also those who claim to represent multi-ethnic and civic oriented parties, making this an interesting discussion, indeed. While events were unfolding on the streets on Friday, there was not a single politician who was prepared to comment on the current situation yet only a few hours thereafter they began to appear in public with their statements all ready. This all against the Bosniaks! One of the first parties to make their views known to the public was the SDP, when their leader Zlatko Lagumdzija, with disgust in his voice, concluded how telling it was that the demonstrations were taking place in predominantly Bosniak inhabited areas of BiH. “Exactly in those parts where the Bosniaks are a majority is there an attempt to portray the institutions as non-functional, as though they do nothing, which is interesting given that pensions in the FBiH are 20% higher than in the RS and average wages are also higher. I suppose they want to soften us before the negotiations [with the EU] and for us to say ‘have your third [entity] and we’ll stay in the burnt down entity.’ I believe this is merely an episode out which we will come out only more stridently to defend the unified BiH state. Some wish to claim that there are only problems here while elsewhere it’s milk and honey, even though that milk and honey was established on a genocide,” said Lagumdzija at the SDP press conference held on Friday, February 7th, 2014. “We would like to draw everyone’s attention to the fact that violent protests were organized exclusively in Bosniak majority areas. The SDA will definitively prove the connection between these destructive attacks and the intentions of certain centers, tied to the future of BiH. The SDA will repeat again that it will not allow further ethnic or territorial divisions of this country,” declared the SDA [representatives] at the end of their summit on Saturday, February 8th, 2014. 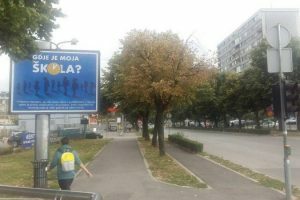 “The protests of the citizens of Tuzla and Sarajevo are orchestrated, manipulating a difficult social situation in the country. The demands of the citizens are justified but I think this is the work of centers which desire to instill further chaos in BiH, in addition to what is already the case,” said Zukic, adding that these centers were located outside of BiH. “I am afraid that this justified revolt of the citizens is being used to destroy BIH and the space where the Bosniaks live and that the Bosniaks are being put in a situation which the destroyers of BiH will use [to their advantage]. The building of the Presidency of BiH is a symbol of BiH, which was defended during the period of aggression on this country. The flag of BiH has never been removed and burnt, not even in war, and yet this time just that was done. This is all against the Croats! At the protests in Mostar, aside from the buildings of the city and cantonal government, the offices of the SDA and HDZ BiH were also burnt. Based on this, if for no other reason, logic would suggest that these protests were not directed at one “national party” by another “mono-national group” but rather [were directed] at all those who have placed citizens in the current situation. In the case of Mostar, it is precisely these two parties which have for four years already, and with no success, attempted to resolve the status of the city and ensured that no elections have been held here in eight years. “At 16:00 an organized gathering of around 350 hooligans crossed from the eastern side into the western side of Mostar and in their anarchist fury burnt the buildings of the HNZ [Herzegovina-Neretva Canton], the city hall and the municipal assembly, the offices of the HDZ BiH, the assembly of the HNZ and several vehicles of the citizens of Msotar. We should especially like to stress, that contrary to the claims of individual media outlets that these protests were caused by the dissatisfaction of the citizens, these events had nothing to do with that and constituted instead a nationalist and politically-directed gathering whose aim was to bring about in the city of Mostar inter-ethnic violence and a war-like state,” declared the cantonal representatives of the HDZ BiH. “No one can convince me that this wasn’t organized with bad intentions,” said Bevanda, adding that “evil always comes to Mostar from the outside,” and that the same has occurred this time. According to him, it was obvious that there existed instructions for the creation of inter-ethnic clashes. Bevanda stressed that the protests were politically instructed, and that we were beginning to see this with the calls for the eliminations of the cantons, the Nezavisne Novine reported. 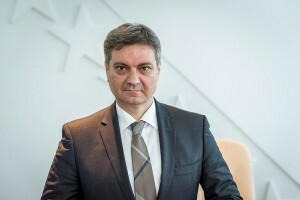 In an interview with Vecernji List, Bevanda elaborated further his thesis on this “putsch against the cantons,” for which he found proof in the attacks on the cantonal government buildings and the Presidency of BiH—even though these were hardly the only buildings attacked during the demonstrations. “One cannot simply burn down a building with that many floors. And yet ten floors were burnt. Obviously, this was all politically directed. And now we’re seeing just that come to the surface with these demands for the abolition of the cantons. It is telling that the buildings of the state and cantonal authorities were attacked,” said Bevanda. “The obvious goal of these coordinated actions is the final and physical destruction of the cantons, and with that the bringing about of a final, partisan political and constitutional solution. We can see how the expectations of the organizers of this controlled chaos have not been fulfilled, which have for some time sought to provoke, marginalize and criminalize the Croat defenders [veterans] of the HVO. The Croat veterans have recognized the intentions of these centers of powers, which had as their aim the manipulation of the [legitimate] grievances of the veterans, and therefore [they] did not participate in the destruction of their own property and the constitutional order of BiH,” their statement declared. This is all against the Serbs! “The events in the FBiH have a political background and are being led by centers of power in the FBiH. The attempts to spread these disturbances to the RS are self-evident but the RS is prepared to put a halt to any attempts at violence or the importing of disturbances from the FBiH,” said Dodik, taking the time also to add his long running claim about how BiH was a state that could not be maintained. 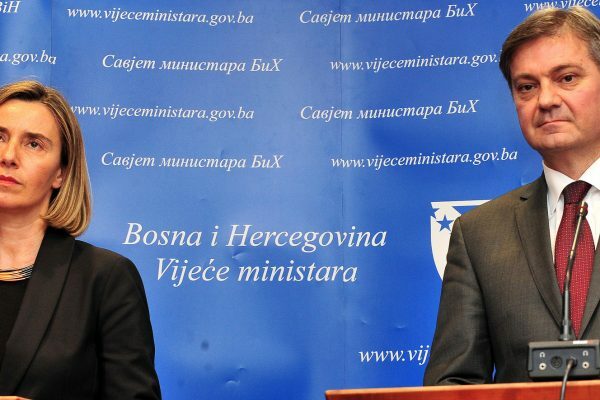 “The chaos in the FBIH has not ceased, the institutions do not function, and what we’re seeing is the proof that BiH cannot survive its internal divisions and that [the state] does not function,” declared Dodik at the joint press conference with the government of Serbia, in his visit to Belgrade with the leader of the SDS, Mladen Bosic. Like Bakir Izetbegovic, Milorad Dodik likewise hurried to meet with the veterans’ organizations which supported his claims. 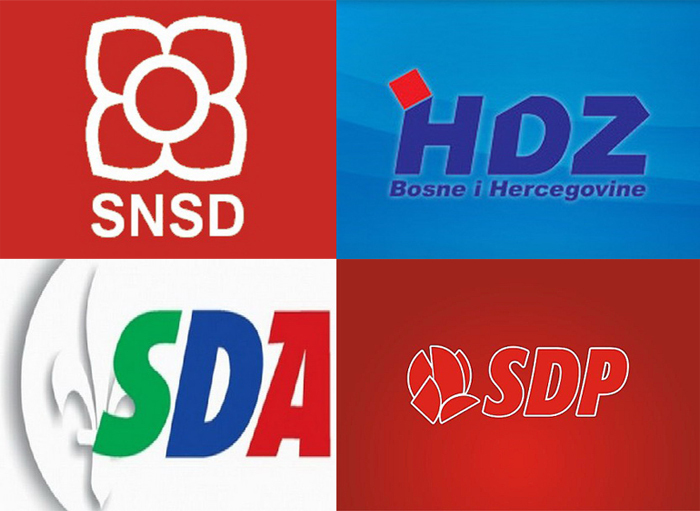 Dodik held a meeting with them today, from which came the joint conclusion that “attempts to carry over the protests from the FBiH into the RS cannot be allowed.” In the spirit of Dodik’s earlier remarks that all protests in the RS would be blocked, as well as Zeljka Cvijanovic’s statements on the “spilling over of crisis from the FBiH,” the President of the Veteran’s Organization of the RS, Pantelija Curguz, added a still more dramatic pronouncement that “buses were being readied in certain parts to start for the RS,” adding in a tone that could only be understood as a threat, that “the RS Police is aware of these attempts and has prepared all the necessary precautions to prevent this. We must declare publicly for all, whoever attempts to destabilize the situation in the RS will meet resistance.” As to the question who was in these “readied buses,” no one had an answer. The protests in BiH were the work of centers of power outside of BiH and directed against the Bosniaks with the aim of destabilizing the state and creating a third entity; the centers of power which exist within BiH have worked against the Croats and have as their aim the abolition of the cantons; the centers of power which exist in the FBiH are working against the Serbs, with the aim of destabilizing the RS, in which there are otherwise no problems or reasons for protest. Whether all these centers of power are coordinating among themselves or whether it was all by chance that they organized all of this at once autonomously, with completely contradictory aims, no one has yet explained. If, on the other hand, we were to think about this logically, we would have to conclude that all the parties which have described these protests in these terms and attempted to “sell” the public the same story about enemy centers of power with ethno-national prefixes did so for the same reason—their own lack of power and general uselessness. Rather than foreign centers of power, the responsibility for the protests lies clearly in the failures of all levels of government across BiH which have brought us to this situation. The representatives of these governments, and the parties that represent them, have once again attempted to dodge responsibility for their own failures and redirect them into national and ethnic animosities, in an almost comical fashion whereby they have accused one another in a nearly identical terms for supposed “organized attacks” on their respective ethno-national groups.